After you finish a marathon, you might face a difficult decision: Should you have cheesecake before, after or for dinner? Other than that, you may already have a strategy for your recovery, and you can’t wait to relax and rest. So, how can you recover quickly and easier after your race? While understandable, the urge to do as little as possible—or whatever you feel like doing—may not be your best choice. Here are some helpful recovery steps you can take right after you cross the finish line, then for the rest of that day, and in the days and weeks ahead. Congratulations, my fellow runners! You have done it! First of all, I hope you feel excited and are enjoying your “Runner’s High!” Your best first move is to sip some water and hug your friend or sweetheart. Then, forget about your tired legs and congratulate yourself and those around you. Wrap yourself in a Mylar blanket or anything else you can find to keep your body temperature from dropping rapidly—and don’t worry about how you might look ;-). Grab something to eat, such as a banana. As soon as possible, change into some dry, warm clothes. You will feel like a new person when you put on a pair of fresh socks and comfortable shoes that have plenty of room to accommodate your newly swollen feet. Try to get back to where you’re staying as soon as possible to relax, shower and rehydrate. If you’re not yet completely sick of sports drinks, have one! It will provide you with some vitamins, a bit of protein (please check that protein is included in the ingredients), and some needed calories in the form of carbohydrates that will help your blood sugar return to normal. Light foods that are easy to digest—especially vegetables and fruits like oranges and bananas—also will help nourish your body and speed up your recovery, not only by providing you with calories but also with necessary minerals, antioxidants and enzymes. A short stroll will help your muscles recover and is a much smarter choice than doing nothing at all. A brief walk is almost the equivalent of the cool down that may have helped you after a shorter event like a 5K. It will help get your blood flowing while starting the process of tissue repair. After your walk, if you can arrange it, a light massage would be ideal. Just be sure to tell the therapist to be very gentle since the purpose is just to get your blood flowing and the toxins out of—and nutrients into—your muscles. After running a marathon, try to keep in mind the so-called “recovery window.” This is the period immediately after prolonged exercise, when the muscle enzymes that support glycogen production—the primary fuel your muscles relied on during the race—are elevated. Therefore, the best things to eat right after a marathon to replenish your muscles’ energy stores are similar to what you ate before. This means placing an emphasis on easily digested carbohydrates. The sooner you are able to take in these calories, the more glycogen your body will produce, and the sooner your muscles return to their normal state. During the first 30 to 45 minutes after you cross the finish line—the prime recovery window—your muscles can absorb 50% more glycogen than at any other time. Research has shown that a little protein—post-exercise—helps your muscles absorb more glycogen (at a ratio 4:1, that means four parts carbohydrates to one part protein). During this time, when your stomach may be still a little unsettled, a good choice would be a smoothie at room temperature because—it is easily digested, has some protein, and is rich of carbohydrates. For your first larger meal, consider replacing lost carbohydrates with whole-grain pasta, basmati rice, whole-grain bagels, oatmeal or other foods that are slow to digest. 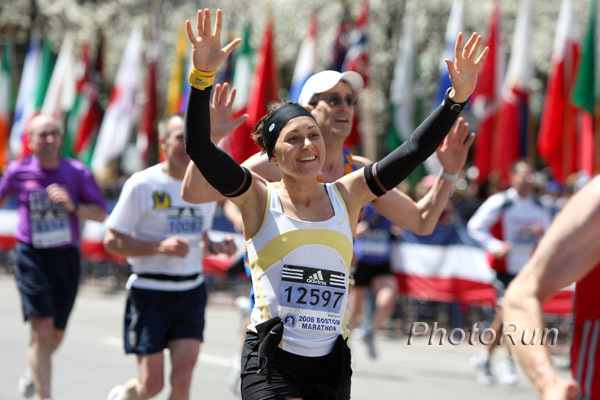 During the marathon, blood flow was largely shunted away from your stomach to working muscles. So give your digestive system some time to return to its normal working condition. It’s usually better to snack a little bit the rest of the day than to sit down to one large meal. Of course, it is up to you to decide how much of this advice, if any, you want to take. After the marathon, it may be difficult to remember much. You may be tempted to simply grab a bag of chips and head for the couch. We all have those moments. But this could delay your recovery for days. 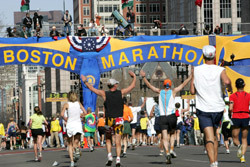 It is easy to misjudge certain decisions after completing such a tremendous effort as a marathon. So, making the best choices during the time right after your race can be very helpful for your recovery! It not only will affect how you feel when you return to running, but also how you will feel at home and at work in the coming week. During the first evening after the race, you might be wound up and unable to sleep much. That is normal and perfectly okay. If that happens, try reflecting on your amazing accomplishment rather than stressing out because you are not able to fall asleep. Another benefit of having a massage soon after the marathon is that it may help you sleep by relaxing your nervous system (which has probably been on overdrive since the night before the marathon!). Now is the time to really listen to your body even more. Deep recovery is your top priority. You just ran 26.2 miles—a great achievement! How quickly you recover will be a combination of your own unique body and how well you take care of it. Some people will recover faster by taking a short walk or a 10- to 15-minute jog. I usually jogged for a short distance the day after, and felt this very light workout helped me reduce stiffness and soreness. If you are an average to good runner, you most likely will feel better after a short jog. However, no matter how good you might feel, limit yourself to three or four miles. Also, on all your runs in the next few days, you will want to keep your heart rate low, so always try to maintain a nice, relaxed pace. 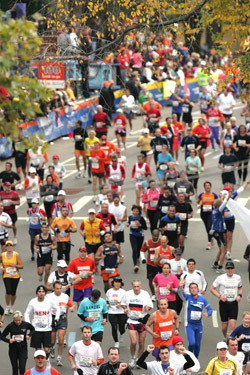 This advice assumes you didn’t hurt yourself during the marathon and can move more or less normally. Avoid running if you strained a muscle or have bad blisters on your feet. Take a break from running if you experienced something which doesn’t allow you to run in your usual style—an altered gait can just create other problems you really want to avoid. Please, seek immediate medical help if you feel you might have injured yourself! You may be wondering, “Why should I do anything at all?” Just as with walking the afternoon after your marathon, light activity will increase your blood circulation, which will help flush out metabolic waste and get oxygen and nutrients flowing to your muscles again. Before doing a light workout, avoid stretching. Your soft tissues will be tight—especially after a hilly marathon. Stretching them ‘cold’—while they’re in this delicate state—puts them at risk for slight tears. In fact, all week long it is a good idea to be very gentle with any stretching—and only do so after a short workout or warm-up. Focus on your calves and Achilles tendons, quads, hamstrings, hip flexors, and glutes. Then limit yourself to a short, gentle stretching session lasting no more than ten minutes. If you have the chance, indulge yourself—and not just with food! If you’ve just run a big-city marathon and aren’t rushing home, maybe some sightseeing, going on a little shopping spree, or doing something completely different from the marathon focus you’ve had for the last week. 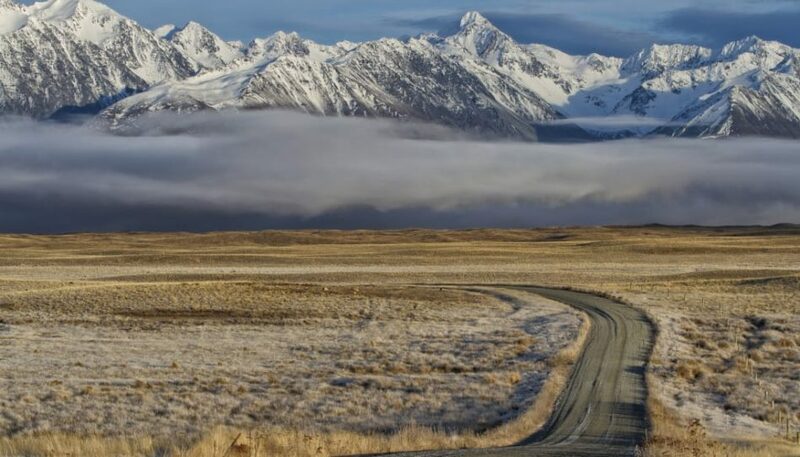 Sightseeing is good because you’ll get to do some walking at a comfortable pace—and, if the walk is long enough, it can provide sufficient and pleasurable recovery exercise for the day. Then you can resume relaxed running tomorrow. If you feel joint pain or otherwise think that jogging or walking will hinder—rather than help—your recovery, it’s still a good idea to do something active because increased blood flow hastens muscle recovery. One idea is to try some easy cross-training, such as swimming, water running, or light spinning on a bike. Since sometimes it is difficult to distinguish between an acute injury and some general soreness, please do not wait too long to see a sports medicine professional if you have a fair amount of pain! In most cases, however, your soreness or stiffness more likely will be the result of simple overloading as opposed to coming from a true injury. Over the years, I have learned to give my body the time it needs to fully recover from a long marathon preparation rather than to rush back into training and racing. The need for recovery is usually underestimated. Runners often feel they have to continue to train right away to achieve another good result. And some of us simply want to get back into the running routine we love. But, to the contrary, by giving your body a chance to fully and deeply recover, you can be on the road to unexpectedly fast results in your upcoming events. Another important part of recovering is to give your mind a break from the focus of training, so when your body is indeed ready to run hard again, you will have the mental energy you need, too. Once you get past the soreness and stiffness, continue to keep your running mileage low. Recovery is still your main priority. This is a good time to mix running with cross-training, like swimming, deep-water running, or short bike rides, so that you stay active while allowing your energy level to return to normal. On your running days, whenever you can, try to stay on surfaces which lessen the pounding on your tired legs (while this is always good advice, it is even more so now.) Try to run your favorite routes so your workouts are as enjoyable as possible. Even if you start feeling great, try to restrain yourself and keep your runs short and at a low to medium intensity; there will be lots of time for hard training later. In the first two weeks after the marathon, it is best to get as much ‘good’ sleep as possible. You will probably be returning to work and your normal life, even though you may be feeling a little low on energy, so if you can get a lot of sleep during this time, you will speed up your recovery. As you feel more and more rested you may want to gradually return to your normal running routine. During that time, it is a good idea to focus on adding quality before quantity. To get a little speed back into your legs, start with a few strides. After one or more of your easy runs, when your muscles are still warmed up, choose a 60 to 100-meter course. Start the first 15 meters or so easy, then accelerate to 80-85% of your peak running speed for the next segment and stay on this comfortable pace, then accelerate again for the next 15 meters up to 95-100%, and finally decelerate. Repeat this stride 5 times—for stronger runners, up to 10 times. Strides are fun and not too intense. They also will help you regain your fast-running form that might have deteriorated a bit during all those months of marathon training. If you feel fine after a few sessions of strides, adding a fartlek workout (a short interval training) once a week on one of your favorite loops, can be a great idea. Please try not to quantify your effort—just get used to running faster again. Around this time you could start adding moderate-but-still-not-hard runs of 40 or 45 minutes. Assuming you still are progressing and don’t have lingering soreness or low energy five weeks after the marathon, you could start to add longer runs and resume track—or other—workouts where you can compare your efforts, such as a tempo run on one of your regular courses. You also will have a better chance to recover faster by continuing to eat a well-balanced diet: one with lots of fresh fruits and vegetables and not too many fatty foods. Depending on your efforts, you will have replaced what you burned in the marathon by the second or third day after the race. Smaller, more frequent meals of healthful food, rather than a huge nightly meal, will leave you feeling better, and you will be less likely to put on unwanted weight—something important to consider now that you’re not burning up calories like you were during your marathon training. The first step in overcoming post-marathon blues, if you have them at all, is to acknowledge your feelings, which sport psychologists say are completely normal. It’s often a good idea to start out by planning activities with friends and loved ones. Even if you don’t feel like doing anything and have to drag yourself out the door, just go! Engaging in these activities will help you to move away, at least temporarily, from your depressed feelings. 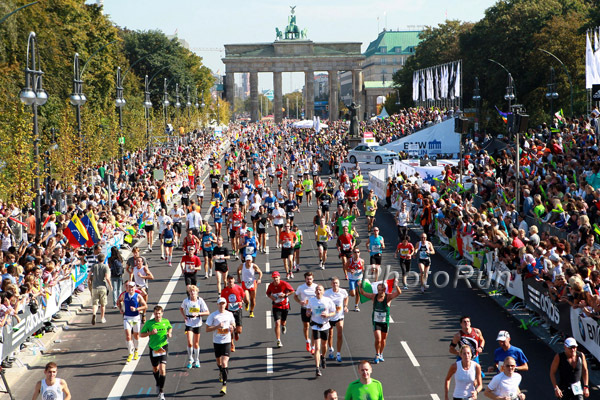 If you are disappointed in part because your marathon didn’t go well, please try to follow all the tips above on diet and exercise so you will recover as quickly as possible. And again, try to acknowledge your feelings. It’s normal to not be happy when you fall short of an important goal. Acknowledging that disappointment, rather than fighting it, will help you let go of it more easily. At the same time, try not to let your unhappiness overwhelm you. Try to use it to get motivated again. Research shows that a positive attitude toward a tough experience actually speeds your physical recovery. By regrouping and analyzing what went wrong in the marathon, such as going out too fast, or having not followed your pre-race nutrition, you will find out what changes to make in your training and racing routines so you can avoid the same problem in the future. While reviewing your performance, it is helpful to be honest about whether your goal was realistic and in line with your training. Some marathoners set time goals that are based more on nice, round numbers—“I would like to run 8:00 per mile or faster,” or “I hope to be able to break 3:00”—than an honest assessment based on their actual preparation. 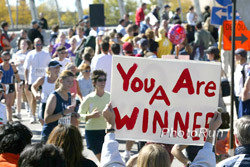 Even if your goal was realistic, were there factors on race day that prevented you from reaching it? Maybe it was too warm, too cold, or too windy. Maybe you had to run by yourself for most of the race. Or maybe you overestimated how quickly you really had recovered from a minor or major injury. You might still have run a superb marathon but missed your goal time by only a couple of minutes because of conditions out on the course. Why beat yourself up over things you can’t control? 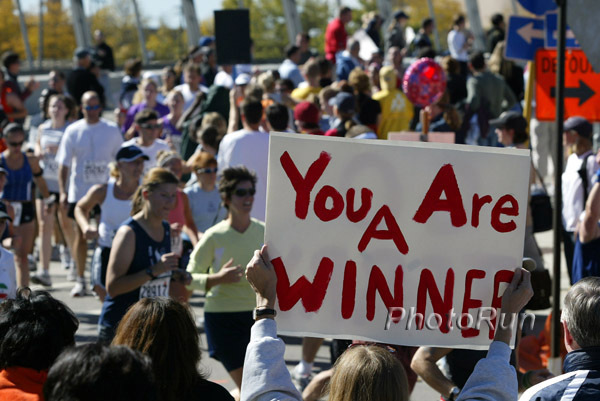 You still completed a marathon—and that is a marvelous achievement! Once you think you know why you missed your goal, carry out the same evaluation several days later. By this time, you might not be as emotional and you might have a clearer view of exactly what happened. Maybe by this point, you even will be able to smile or laugh about the experience, especially if it were something as simple as going out too fast in the first few miles. 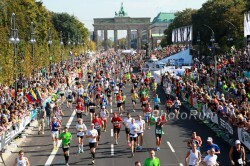 If you are feeling a little emptiness even though your marathon went well, it might be helpful to look for a new goal. (For some thoughts about choosing what I call “good goals,” see the article “Make Your Wishes Come True: How to Set and Achieve Your Goals.”) It does not have to be monumental—it could be something fun like taking part in a track meet. You also could now turn your focus to shorter races and use the endurance you built during marathon training as a springboard to success at 5Ks or 10Ks. I often tried to recover quickly from spring marathons so I could make use of my hard-earned fitness and endurance during track season. For example, a speedy recovery after running the Boston Marathon one year helped me to set a 10,000-meter personal best on the track only six weeks later. 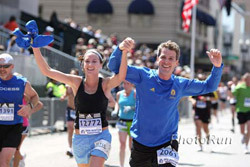 One of the best ways to get through this post-marathon period is to help a friend meet a goal. Become that person’s supporter—maybe running with her (or him! ), or providing her with fluids on a long run, or keeping her company during a track workout. Helping your friend will help you regain your confidence in yourself. Finally, it will be helpful to get re-involved with other areas of your life. You probably sacrificed a lot during your marathon preparation. Now you can spend more time again with your family or participate in other outside activities you couldn’t enjoy while you were training for the marathon. It is time to return to the people and things you love too. 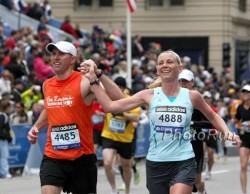 I hope you will be glad you did when you once again catch the marathon bug and start serious training all over again! Good luck for a speedy recovery! I wish you many successful new goals in running and in life! © Copyright 2007-2019 by Uta Pippig and Take The Magic Step®. All Rights Reserved.